The story of your content. Data tells a powerful story — about your content, who reads it, and what’s possible. Inform your editorial strategy and energize your business with a content analytics platform that centralizes data from your distributed audience and uncovers and visualizes real-time insights around reader engagement. See how your audience connects with your content in real time, assess KPIs over the long term, and grasp how your videos capture viewer attention. Adapt user experience and test page elements like headlines within your normal workflow, to know what moves your most valuable audience. Start each day with the data you need — whether it's automated insights delivered to you, or flexible tools to build more in-depth reports. We’re proud to partner with the world’s leading media companies. 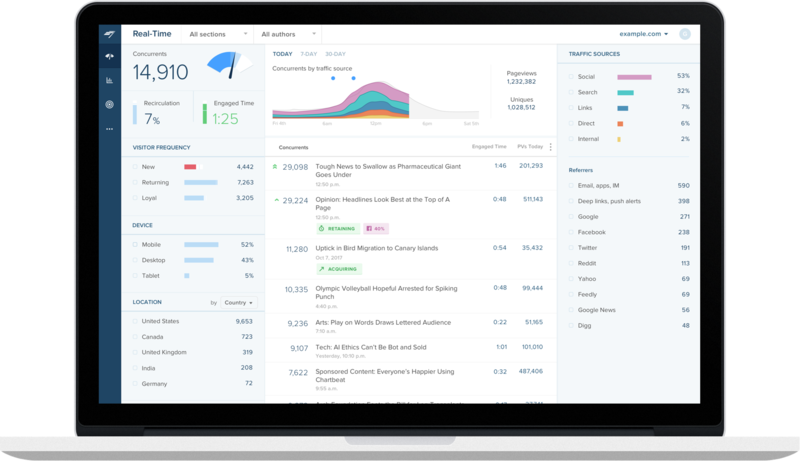 The adoption of Chartbeat has been a major success – it has helped us bring experimentation to the newsroom, and it is transforming our business. I see tremendous value in figuring out how to identify those who with the right nudge would be most likely to want to come back again. Data is not a threat — it’s a tool. Read what’s on the edge of data and journalism.